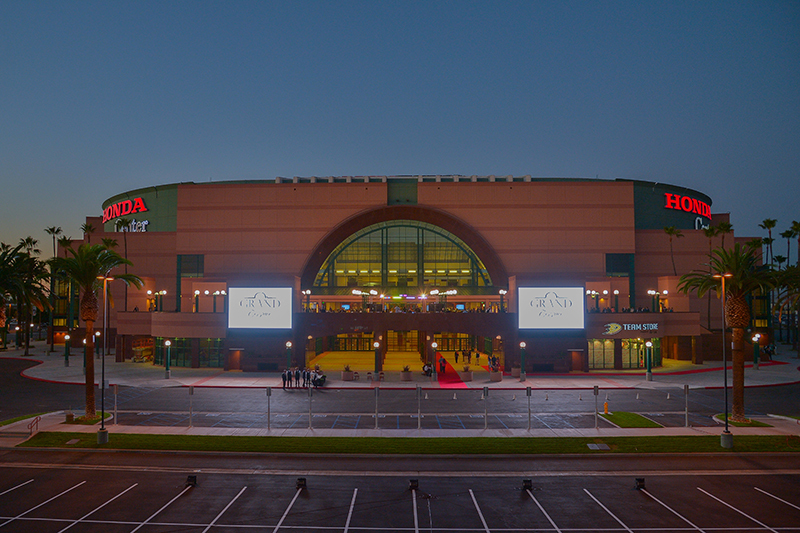 Anaheim, CA- Honda Center, one of the premier entertainment and sports venues in the United States, recently completed their Grand Terrace Project, a 15,000 square foot indoor-outdoor entertainment space, and new main entry way to the venue. System design and installation services were performed by Apex Audio, a leading provider of professional audio and integration. To be able to fully cover the large entry way and parking lot area, Apex chose the McCauley MLA2 small format line array. The MLA2 is ideal for this type of installation because of its wide horizontal pattern and high sensitivity high frequency section. To provide the most low frequency possible to such a large space, Apex chose the McCauley M421 quad 21” subwoofer. 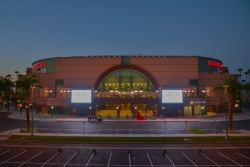 The system consisted of two arrays of weatherized MLA2 modules mounted underneath each 24’ video screen. A weatherized M421 was sunk into a vault at the base of each screen. Amplification for the MLA2 arrays was provided by QSC PL380s and PL340s. Each M421 was powered by a LAB.GRUPPEN FP 14000. The QSC Q-SYS was chosen for signal processing, distribution and control of the entire installation.